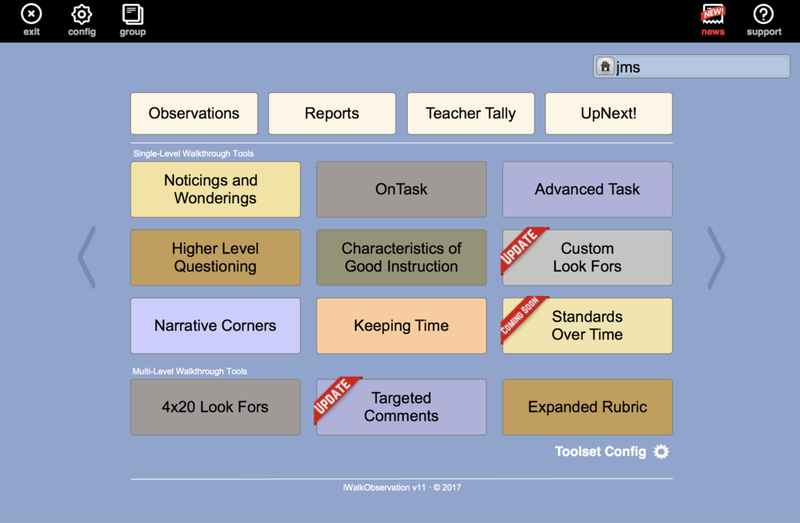 With iWalkObservation v11, experienced and new users will find powerful updates to favorite tools alongside a new tool, all focused on making your observations more powerful, your feedback more meaningful, and teacher growth and reflection more effective. Classroom Rapport joins forces with Custom Look Fors! As the Custom Look Fors tool has grown, many have noticed that Classroom Rapport is best suited to live inside Custom Look Fors as a look for list. We made that change! In v11, the Classroom Rapport tool can now be found as a Custom Look For list. Targeted Comments takes everything that was fantastic about 60 Comments and expands on its effectiveness. Targeted Comments allows the user to create an endless number of look for lists, each with up to 20 focused look for elements. Previously customized 60 Comments lists will be imported directly into the newly formatted tool, ready for use. Standards Over Time (coming soon) is an exciting, new tool unlike any other in the iWalkObservation tool chest. With Standards Over Time observers capture notes on observed standards or look for elements over time. The tool is intended to capture quick or long-term observations, each on a single, user-defined teaching standard or look for. These observation notes can be viewed by standard or look for element and by date or timeframe to provide the observer and the observed with powerful longterm feedback. Anticipate Standard Over Time to be fully released by late September. Q: How do I archive past years observations so they are no longer in iWalkObservation but safely stored just in case I need them in the future? A: Have a look at the Records Maintenance support page linked here. Q: I need to add staff members to the new school year and clean up some who are no longer in my building. How do I do that? A: Managing staff lists is very easy once you know where to look. Take a look at the Managing Staff Lists support page found on the iWalkObservation.com website and linked directly here. Q: Knowing there is a new version coming out, what can I do to prepare? A: Back up your data now. You will be asked to back it up again during the updating process as well. To back up your data on iWalkObservation, from the main menu, tap on Config then Data Backup. Q: How do I renew my iWalkObservation subscription? A: Your annual subscription, if purchased by a credit card, will auto-renew. To update your card or check your subscription renewal date, click here and follow the online prompts. Be sure to use the email address used to purchase your iWalkObservation subscription.